The State Government and the Autism Advisory Panel (AAP) have entered into a research partnership with the Australian Autism Co-operative Research Centre (CRC) to establish an autism research base in Tasmania. The Minister for Human Services Jacquie Petrusma joined with Andrew Davis the CEO of Australia’s Autism Co-operative Research Centre to announce the major Autism research partnership for Tasmania. The State Government will contribute over $800,000 in cash and in kind (through staff) over the next four and a half years to establish and run the partnership. The Autism CRC is the world’s first national, co-operative research effort focussed on Autism. Tasmania will benefit from research examining the diagnosis and treatment for individuals with Autism Spectrum Disorders. A current research project being conducted within the partnership between the State Government and the Autism CRC includes identifying early markers of Autism in an attempt to reduce the age of diagnosis of Autism through a tool called Social Attention and Communication Study-Revised (SACS-R). 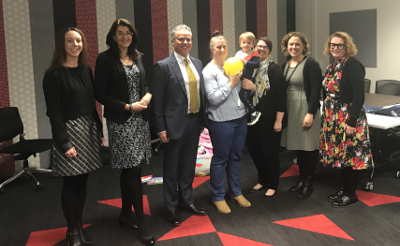 The objective of the SACS-R project, currently underway in the state, is to identify infants and toddlers at risk of Autism Spectrum Disorders during the routine assessments of young children at 12 and 24 months of age. Recent Australian studies indicate the SACS-R surveillance is more reliable than traditional one off screenings identifying signs of Autism Spectrum Disorder in young children. The use of the assessment tool is currently being done as part of the routine child health checks undertaken by the Child Health and Parenting Services (CHAPS). Two year old Avery Long was able to participate in the study and as a result he has been diagnosed earlier than would normally have been the case. His mum, Theresa, said the early diagnosis was extremely beneficial and will assist with earlier than usual treatment options for Avery giving him a much better chance of good social and cognitive development. The Autism CRC brings together a unique mix of participants – government, university, research and not-for profit organisations and world class researchers. A big well done to Di King Senior Project Officer - Autism and Children’s Therapy Services for organising the terrific launch of the partnership. Theresa and Avery Long at the launch. Left to right: Cassie LeFevre - Chairperson of Autism Advisory Panel, Minister for Human Services Jacquie Petrusma, Andrew Davis - CEO Autism CRC, Theresa and Avery Long, Kathryn Fordyce - Autism Advisory Panel Member, Di King Project Officer - Autism and Children’s Therapy Services and Dominica Kelly, Nursing Director - Early Years, Child Health and Parenting Services.